The ST-Elevation Myocardial Infarction (STEMI) GUIDELINES Pocket Guide is based on the latest guidelines of the American College of Cardiology Foundation (ACCF) and the American Heart Association (AHA) and was developed with their collaboration. 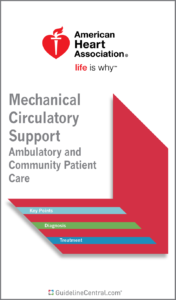 This practical quick-reference tool contains detailed guideline recommendations for treatment at every stage, from out-of-hospital first contact through posttreatment follow-up, with indications for angiography, PCI, reperfusion, stents, CABG, fibrinolysis, aspiration thrombectomy, and adjunctive antithrombotic therapy; a list of fibrinolytic agents with doses and comments; medical therapies with doses and comments; and risk assessment, follow-up, and CHADS2 scoring information. Everything a cardiologist of allied provider needs to know about the ACC / AHA STEMI Guidelines. Systems of care should be established in each community to care for patients with ST-Elevation Myocardial Infarction (STEMI) with the ultimate goal of reducing total ischemic time between symptom onset and reperfusion. Primary percutaneous coronary intervention (PCI) is the preferred reperfusion strategy for patients with STEMI when it can be done in a timely fashion (ie, within 2 hours of first medical contact) by expert operators. Following delivery of fibrinolytic therapy when indicated, patients should be transferred to a PCI-capable center, even if clinically stable with signs of successful reperfusion. Non-infarct artery PCI, when indicated, should be deferred to a time remote from primary PCI in the absence of shock or severe heart failure. a The proposed time windows are system goals. For any individual patient, every effort should be made to provide reperfusion therapy as rapidly as possible. Prehospital ECG to diagnose STEMI is used to activate the PCI team while the patient is en route to the hospital. Emergency physicians activate the PCI team. A single call to a central page operator activates the PCI team. Goal is set for the PCI team to arrive in the catheterization laboratory within 20 minutes after being paged. Timely data feedback and analysis are provided to members of the STEMI care team. a Balloon angioplasty without stent placement may be used in selected patients. A loading dose of a P2Y12 receptor inhibitor should be given as early as possible or at the time of primary PCI to patients with STEMI. a The recommended maintenance dose of aspirin to be used with ticagrelor is 81 mg daily. It is reasonable to begin treatment with an intravenous GP IIb/IIIa receptor antagonist such as abciximab (IIa-A), high-bolus-dose tirofiban (IIa-B), or double-bolus eptifibatide (IIa-B) at the time of primary PCI (with or without stenting or clopidogrel pretreatment) in selected patients with STEMI who are receiving unfractionated heparin (UFH). b 30 mg for weight <60 kg; 35 mg for 60-69 kg; 40 mg for 70-79 kg; 45 mg for 80-89 kg; and 50 mg for ≥90 kg. 35 mg) over the next 60 min. Total dose not to exceed 100 mg.
d Streptokinase is no longer marketed in the United States but is available in other countries. e Streptokinase is highly antigenic and absolutely contraindicated within 6 mo of previous exposure because of the potential for a serious allergic reaction. a Viewed as advisory for clinical decision making and may not be all-inclusive or definitive. Aspirin should be continued indefinitely (I-A), and clopidogrel (75 mg daily) should be continued for ≥14 days (I-A) and up to 1 year (I-C) in patients with STEMI who receive fibrinolytic therapy. a Although individual circumstances will vary, clinical stability is defined by the absence of low output, hypotension, persistent tachycardia, apparent shock, high-grade ventricular or symptomatic supraventricular tachyarrhythmias, and spontaneous recurrent ischemia. b The recommended ACT with no planned GP IIb/IIIa receptor antagonist treatment is 250-300 s (HemoTec device) or 300-350 s (Hemochron device). Note: Risk factors for cardiogenic shock (the greater the number of risk factors present, the higher the risk of developing cardiogenic shock) are age >70 years, SBP <120 mm Hg, sinus tachycardia >110 bpm or heart rate <60 bpm, and increased time since onset of symptoms of STEMI. Note: These recommendations apply to patients who receive intracoronary stents during PCI for STEMI. Among individuals with STEMI who do not receive an intracoronary stent, the duration of DAPT beyond 14 days has not been studied adequately for patients who undergo balloon angioplasty alone, are treated with fibrinolysis alone, or do not receive reperfusion therapy. In this subset of patients with STEMI who do not receive an intracoronary stent, the threshold for initiation of oral anticoagulation for secondary prevention, either alone or in combination with aspirin, may be lower, especially if a shorter duration (ie,14 days) of DAPT is planned. Note: Individual circumstances will vary and depend on the indications for triple therapy and the type of stent placed during PCI. After this initial treatment period, consider therapy with a vitamin K antagonist plus a single antiplatelet agent. For patients treated with fibrinolysis, consider triple therapy for 14 days, followed by a vitamin K antagonist plus a single antiplatelet agent. a CHADS2 = (Congestive heart failure, Hypertension, Age >75 years, Diabetes mellitus, previous Stroke/transient ischemic attack [doubled risk weight]) score.